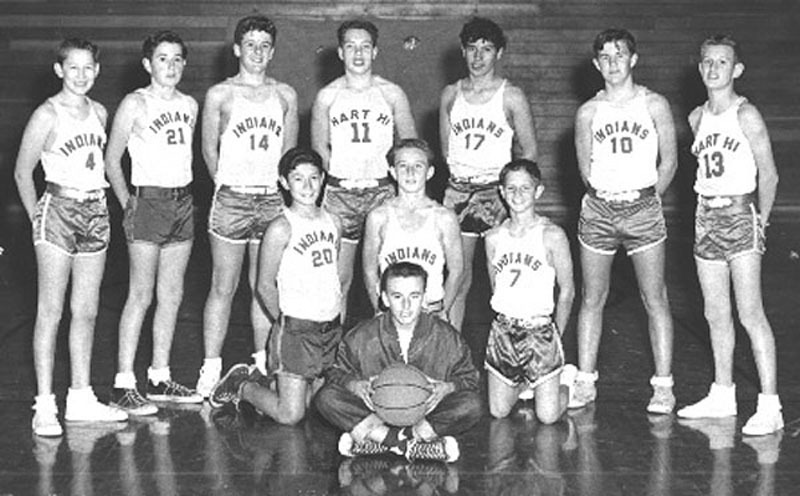 William S. Hart Junior & Senior High School, Eighth Grade Basketball Team, 1955. Yearbook photo. Standing, left to right: Harold Neighbors, Bill Rice, Jerry Jones, Jim Bottoms, Leroy Rios, Terry Stepp, Don Wagoner. Kneeling: Ernie Daniel, Kelly Bowman, Don Wagoner. Front: Bill Bentley, Equipment Manager, 7th grade. WR5501: 19200 dpi jpeg from smaller jpeg | Online image only.